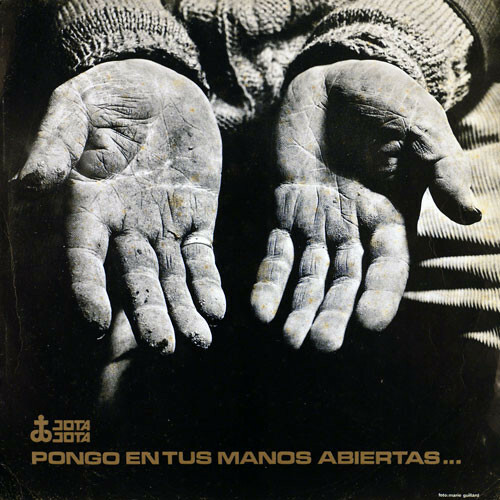 "Pongo en tus manos abiertas" ("I Put Into Your Open Hands") is an album recorded by Víctor Jara with the musicians from Quilapayún in June, 1969. It was the third album released by the DICAP record label. A shout emerges crossing the large expanse of our territory. cannot but look forward into the future. and in the song of protest. which is identified more than compromised with the people. Released in 1969, Victor Jara's fourth album was his masterpiece, a landmark in the evolution of the nueva canción. Intrinsically Chilean yet part of a broader Latin American sensibility, Jara's music blended indigenous instrumentation and folk forms with a contemporary singer/songwriter orientation; his lyrical focus on land reform, organized labor, poverty, imperialism, and race specifically addressed Chile under Frei's presidency but also engaged with a Pan-American revolutionary consciousness and a global progressive awareness. Jara negotiates these three realms throughout this record, backed by Quilapayún. Interwoven with haunting flutes, "A Luis Emilio Recabarren" pays lilting homage to the Chilean Communist Party founder, while the passionate "Preguntas por Puerto Montt" responds to a government-ordered massacre of peasants. The accusatory urgency of Jara's tone and the music's rhythmic insistence differentiate this song from the strum-along preaching that often characterizes protest music. Similarly, "'Movil' Oil Special" raises another topical issue of the period (the violent suppression of student activists), but Jara's oppositional approach is inventive and playful as he frames his concerns as musical theater, punctuating infectious rhythms with crowd noise, gunfire, and sirens, showing rather than simply reporting events. Several cover versions look beyond Chile. A spirited rendition of Uruguayan Daniel Viglietti's "A Desalambrar" speaks to the perennial Latin American problem of land rights and the Caribbean lullaby "Duerme, Duerme Negrito" invokes the continent's racial heterogeneity; on "Juan Sin Tierra," Jara turns his hand to a Mexican corrido and "Zamba del Che" celebrates the Argentinean guerilla leader. A version of Pete Seeger's "If I Had a Hammer" connects with worldwide struggles for civil rights and workers' rights. Most memorable, though, is Jara's own "Te Recuerdo Amanda": fusing the personal and political, the poetic and prosaic, this poignant snapshot of working people is the record's crowning achievement. VA - Old Time DJ Come Back ... Again! Doc Watson - Home Again!